When I first dove into PPC advertising with AdWords, I had one bidding strategy in mind: occupy the top three positions at all costs, hold my ground – and then the clicks would flow right in. Most of my clients were thankful with the uptick in traffic and they were thrilled that their ads were prominently displayed at the top of the page. But as the data started to pile up, not EVERYONE was as ecstatic with the results. I learned very quickly that the full picture includes a whole lot more than clicks or even conversions at face value. While aiming for the top position worked for some, creating an AdWords bidding strategy can be tricky and it’s not a one size fits all. I noticed that some ads were racking up the most traffic but converting the least and at the highest cost. My landing pages were relevant and optimized for conversions, but the results told a different story. After digging around and finding an alarmingly high bounce rate, I had my answer– trigger happy searchers must be clicking on my ad out of habit. There’s a phenomenon in Googleland where the searcher is so trusting with Google’s response to their query that they click on the top result on the SERP without even looking at it. That’s what was happening with my ads. Searchers looking for products similar to ours were clicking our ads and only realizing afterwards that we didn’t have what they needed, resulting in wasted ad spend because of their reflexive click. I needed to make adjustments and position my ads so that searchers would read the text before clicking. I wanted to bid out of the top positions but not bid my way off the first page. My new goal was to float between positions 4-6, but how could I achieve that without obsessively monitoring my bids and thereby constantly changing them? After researching and experimenting with different solutions, I found my answer, AUTOMATED RULES! Of course, Google makes it so easy. 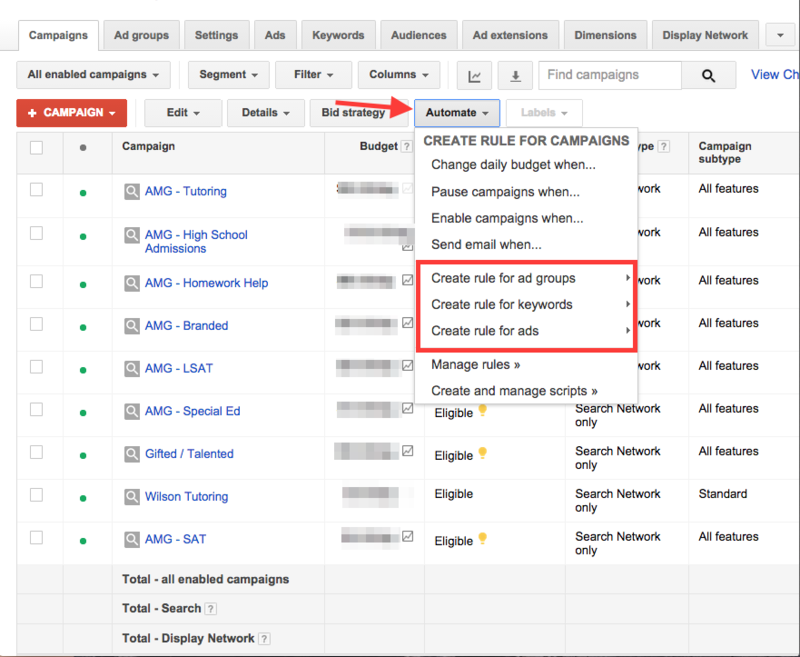 The Automate drop down is on top of columns under campaigns, ad groups, ads, keywords, and audiences. I wanted Google to respond to seperate actions so I set two rules as a response. I configured my rules to automatically adjust my bids when my ad landed outside the perimeters I set. Google increased my bids 10% when landing in positions less than 6 (larger in number) and decrease my bid by 15% when landing in positions greater than 4 (smaller in number). Voila! My ads were now comfortable in their new cozy home between positions 4 & 6. I was fending off unwanted “habit” clicks and attracting searchers who were actually reading my ad before clicking. Even though my traffic dipped, my conversion rate increased and I was attracting the quality traffic my ads needed to succeed. Additionally, don’t forget about the impact your quality score will have on your positioning. If your Quality Score is not healthy, a higher max CPC bid won’t necessarily help you reach your desired position. Stay tuned for similar articles as I continue to explore and master everything AdWords. I’d love to hear your thoughts and comments, especially if you’ve experimented with any interesting bid strategies in your own accounts. Thanks for reading, and looking forward to next time!